I think we all, at times, wonder how it would be if the world were different, that’s the essence of imagination. I don’t think utopian ideas are bound to fail, but quite likely when they become real or succeed they stop being called utopias. Think about the Internet, or women’s rights for example. Some of the things that have been achieved are now considered as normal. The AK-47 is a frightening thing, an object of terror. I remember traveling through Central America and seeing traffic cops waving their arms, directing vehicles this way and that, with an AK-47 slung over their shoulders. That is scary. Here, it isn’t unusual to be waiting in line for fast food, noticing a cop in line beside you, and being a little intimidated by that big handgun hanging off his belt, inches away from you. Compared to a guy directing traffic with a machine gun, though, it’s no big deal. The AK-47 is not frightening because it is beautiful. It is ugly. It is not frightening because it is accurate – a lot of weapons are more accurate. The AK-47 is frightening because it is ugly and cheap, and reliable. It is a very efficient way to kill people. Would an AK-47 still be frightening if it was made of translucent purple plastic? Probably. But it would not be as ugly. 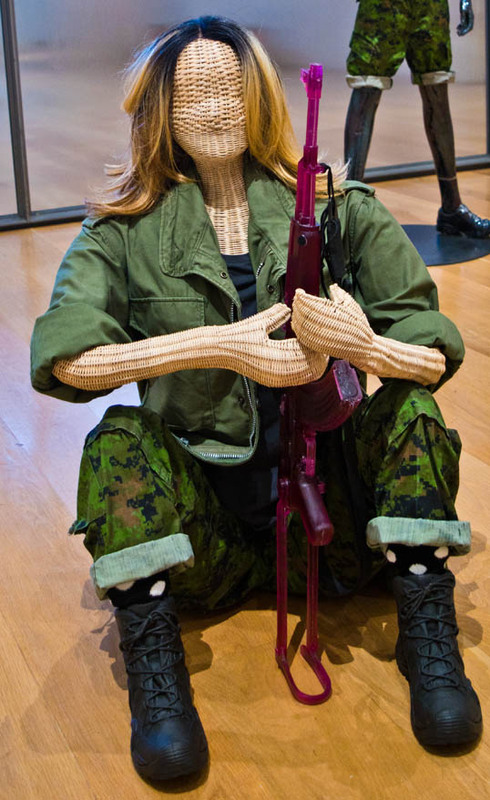 This entry was posted in Photography and tagged ak-47, Dallas, gun, mannequin, Nasher, perret, Sculpture, soldier, Texas, uniform. Bookmark the permalink. An AK is also quite illegal. In the US, anyway. Surprising, that. It’s illegal for individuals – the military, police, and other branches of the government all have access to automatic weapons. For what it’s worth. It gives over 50 pages of results.